In Italy, la dolce vita is about celebrating and savoring the country’s myriad liquid treasures, and in the northwestern reaches of the famed boot, that daily dictum involves Barolo Chinato. A bittersweet style of aromatized and fortified wine, chinati hail from Italy’s Piedmont region, the area also home to the highly prized (and priced) Barolos. It’s these noble Barolos—classified and protected under local law—and the Nebbiolo grape from which they’re made, that form the base wine for the rich aperitif known as Barolo Chinato. The wine’s creation is often credited to a Turin pharmacist, though several estates claim Barolo Chinato as their own. Steeped with cinchona bark (which lends its name to the wine), spices, sugar, herbs and botanicals such as orange peel, cassia bark and wild juniper, Barolo Chinato braces with a bitter burst of quinine before showing its softer side. And with vintners closely guarding their secret formulas, no two are quite alike. 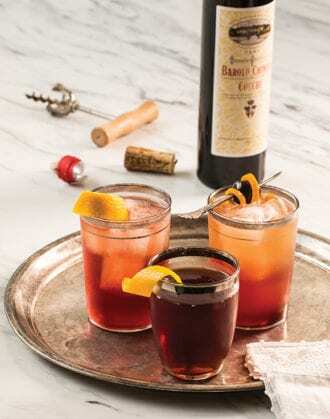 Some, like Cocchi, are assertive with wintry baking spices, while others, like G.D. Vajra, opt for a milder approach, with notes of roasted plums following the initial bitter bite. In this case, the cellar’s loss is the cocktail’s gain. “Chinato is so versatile,” says Joe Hines at Terminal Bar in Denver, who uses the wine in his Wynkoop Sour. “It can bring sweetness, bitterness, herbal notes and also some tannin to the glass.” At Bastille in Seattle, Barolo Chinato blends with rye whiskey, dry vermouth and Campari for a rich spin on the classic Old Pal, and at The Gin Joint in Charleston, South Carolina, the wine mingles with aged rum and sweet sherry in the fragrant Shipwreck. Bold and bitter flavors converge in this wintry cocktail. Combine all ingredients and stir with ice. Strain into a chilled rocks glass and garnish. Barolo Chinato adds extra depth to this spin of a classic. Barolo Chinato lends a ruby, jewel-toned color to this bourbon-based sipper. Combine all the ingredients, except the Barolo Chinato, and shake with ice. Strain into an ice-filled glass, pour the Chinato over the back of the spoon into the glass (it’s okay if it sinks to the bottom) and garnish. Fresh Pear Syrup: Combine 1 cup each of water and granulated sugar with 1½ cups of fresh pear juice (purée and strain fresh pears to extract the juice) in a small saucepan and bring to a simmer. Stir until the sugar dissolves, remove from the heat and cool to room temperature before bottling. Keep refrigerated for up to 2 weeks. A sultry mix of smoke, fruit and spice.